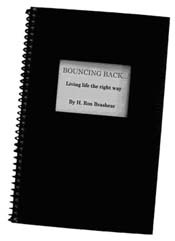 Youth of Honor, in partnership with e-Luminated Manuscripts, is proud to announce the release of “Bouncing Back… Living life the right way” by H. Ron Brashear. Through the telling of his very personal and troubled youth, Mr. Brashear takes the courageous step to divulge all to assist others realize that it is never too late to take a personal “you turn”. Mr. Brashear’s real-life success story serves as a testimony that personal triumph can be accomplished and he shares with you on how he did it so you can too. Mr. Brashear will tour Atlanta and other cities sharing his school of hard knocks story which tells of him landing in a jail cell after his hustler-like lifestyle dead-ended, resulting in a dishonorable discharge from the U.S. military. But, as bad as those self-inflicted wounds appeared, he managed to piece his life back together and rose up the ranks to receive recognition as one of AT&T's top customer service representatives in the nation. Currently, Brashear is an Information Technology Program Management Director and, in addition, is a boxing enthusiast and columnist for www.insideboxing.com. With at least 95% of all State prisoners being released back into the community after serving time in prison, ‘Bouncing Back… Living life the right way’ is needed as an educational tool as well as personal roadmap to assist these inmates in changing their ways and pursue a better path toward living life the right way. It is not only the belief of H. Ron Brashear that the lives of past offenders can be changed but that they themselves can and must serve as role models for our youth so the cycle does not continue with our youth. If you know someone that is incarcerated, soon to be released or on the darker side of the road to life, ‘Bouncing Back… Living life the right way’ could be the message they need to hear. It is never too late to learn from our mistakes and youth are never too young to be taught right from wrong. Begin your personal bouncing back journey today. on how to bounce back. ** Note: International shipping is $7.50 and all shipments to Canada are $5.50. Please click here to purchase an International or Canadian order. inspirational story to self improvement. - Besides purchasing a book for yourself, '10-TO-WIN' allows you to reach out and touch the lives of nine friends or people in need and provide them a resource to assist them in reaching greatness in life.